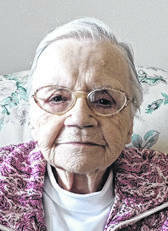 TROY — Mary Ellen “Patty” Keller, a resident of Tipp City, who recently moved to Brookdale Assisted Living in Troy, turned 98 years old today, Wednesday, March 27. Keller graduated from Newton Schools and has resided in the Miami County area her entire life. She has two living children, six grandchildren and 12 great-grandchildren. She is preceded in death by one child and two grandchildren. She would enjoy hearing from people through receiving birthday cards, which can be sent to Brookdale Assisted Living, Care of Mary Ellen Keller, 81 S. Stanfield Drive, Troy.